Advertising is everywhere and in many different forms. Some are more easier to spot than others, and some advertisements are created by news outlets to look like articles, but are actually advertisements, and that is where native advertising comes in. To put it simply, native advertisement is paid content. A company can pay a news outlet to run a "story" and the content could look, feel, and read exactly like the news outlet's articles, but isn't created by them. For native advertising to work, the content must align closely with the outlet's voice and format. For people, this type of advertising is hard to spot and that is why it is so important to identify it. "Don't trick them. Don't piss them off." Those are wise words from Eric Goeres, director of innovation at Time Magazine. Goeres is referring to everyday people when he says "them" and is the greatest problem with native advertising. People don't like to be fooled, and this type of advertising can be misleading. If a news outlet is paid by a corporation to publish an article, how truthful do you think that article is going to be? Or would you even know it was paid for? The same goes for a review of a product. That reviewer might have been paid off by the company to write a good review, how would you know? Another problem native advertising has is it doesn't help the brand outlet much. Take a credible, huge audience outlet like the New York Times. If they used native advertisement for their newspaper like Buzzfeed does the NYT would lose a lot of its audience and maybe think they sold out. According to a study from Phys.org only 7 to 18 percent of readers could tell between a real news story and a native advertisement. Those numbers are scary to think about when we're already surrounded by advertisement and only a handful of people know what they're really reading. Some native advertising can be useful though, some instances it makes for good advertising. 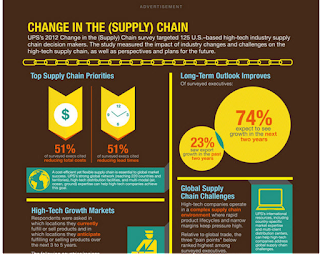 An example of this comes from WorldStream.com involving UPS and Fast Company. 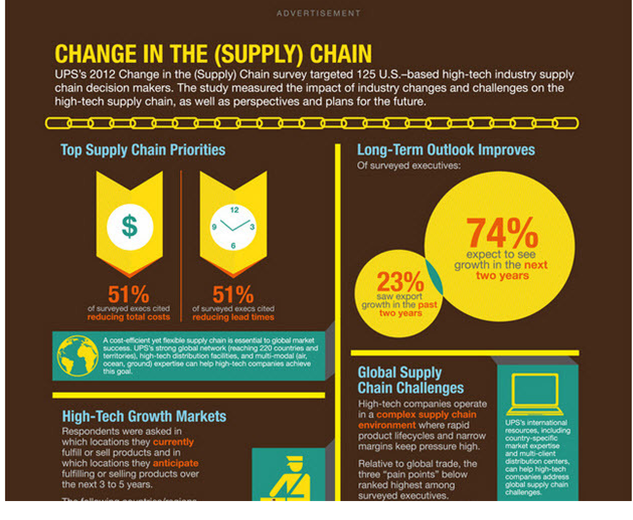 Fast Company put an infographic of UPS's supply chain management on their website. It looks "virtually indistinguishable" from the content Fast Company publishes. The only way you can see it is an advertisement is from the little gray "Advertisement" tag at the top. Without the advertisement tag on top of the graphic, I was not able to tell whether this was a graphic to a story, or an advertisement. In conclusion, native advertisement might be harmless from first impressions. But, if people can't tell a difference from an advertisement and a news story, news media loses credibility and that's going to be the news people get.